Casino Luck have been kicking about since 1999, which actually makes them one of the oldest online casino companies in the industry. With all that knowledge behind them they have managed to go on be one of the best online casinos, but it’s fair to say that they probably don’t get all the plaudits that they deserve. Throughout this article we will be looking at what’s made this online so successful over the years and also at what they are continuing to do improve and grow their online casino. Casino Luck is the brain Child of EveryMatrix Ltd, who has been around the online casino for a good while now. These guys own several online casinos, but it’s fair to say that Casino Luck is definitely one of the biggest and most successful. What we have found out is that the company plough over 50% of their resources into Casino Luck, highlighting the importance of this brand to their overall standings. Casino Luck haven’t always been as big as they are today however and EveryMatrix Ltd decided in 2011 that it was do or die for the brand. 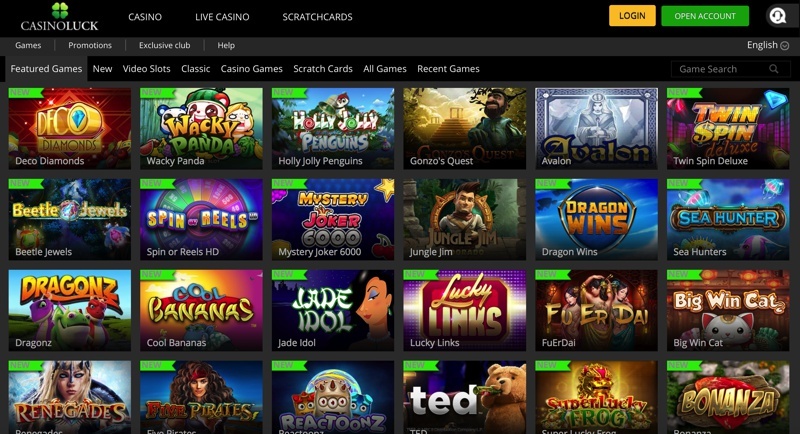 A re-design came and with it a load of new promotions to try and entice new customers into the casino. This had a massively positive effect, with the company reporting that their player database had grown over 50% more than on their previous years numbers. The company is based out of Dublin and are licensed with the British Gambling Commission. Whilst this would be something a lot of players will likely never be aware of, it’s something that they are very proud of, due to the massive number of online casinos who are now based offshore, mainly due to tax purposes. Casino Luck were also one of the first online casinos to really go to town with using multiple software developers within their casino to boost the number of games on offer. This is very much the norm these days, but it’s been this kind of innovation that has seen Casino Luck become the established online casino it is today. The casino is powered by NetEnt, Microgaming and IGT, three of the biggest software developers in the industry. Having these three behind the brand means that they cannot offer a dedicated download version, but you can access the casino by either instant browser play or via your mobile. The site comes packed with games and it’s the slots section that is most impressive with over 500 titles to choose from. On top that you get a good range of table games along with some massive jackpot games including King Cashalot and The Dark Knight rises.